Oftentimes when you're talking about console hardware the thing you have to consider is that the hardware itself rarely sells itself. As the old saying goes, just because a system is more powerful doesn't mean it's better. In this case, we learn that software really does sell hardware, especially in the case of the Wii U.
Geek Wire has a very informative breakdown of what the sales looked like (and what it looks like) for the current generation of home consoles when it comes to first-party titles helping boost the sales of the console. Following the news that Mario Kart 8 has sold 2 million copies, Geek Wire decided to look further into the sales trends of the hardware itself and how well the SKUs moved following big first-party software releases, and the data is pretty obvious. In fact, Mario Kart 8 has boosted up the Wii U's total sales more than Titanfall did in a bundle for the Xbox One or inFamous: Second Son managed to do for the PS4. Check out the chart below that Geek Wire put together. As you can see, the Xbox One got a major boost from the release of Titanfall but by the third week in Microsoft was actually selling fewer Xbox One consoles than what they were moving within the five week average before the game's release. That's somewhat frightening as it indicates that interest dropped following the release of a big brand exclusive title. Then again, the game was also made available on the Xbox 360 and the PC, too. As for Sony, the PS4 was selling quite well before the release of inFamous: Second Son but it sold even better once the game did release. 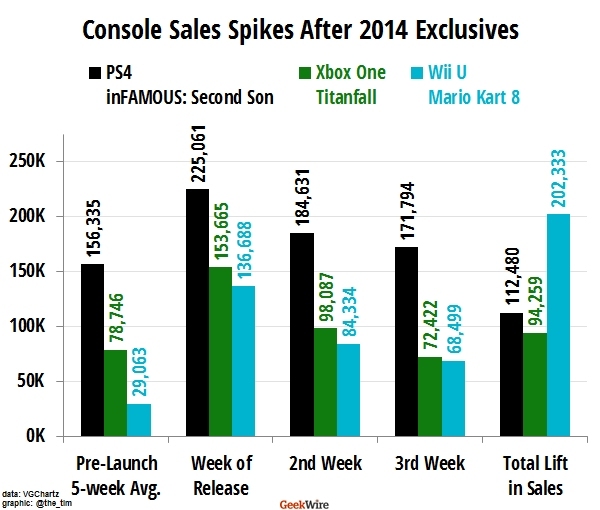 Unlike Microsoft, however, Sony's console stayed above its pre-release sales average following the release of inFamous: Second Son. What's also interesting is that Titanfall actually managed to top the charts according to the NPD results, however despite the software selling well it wasn't quite able to raise the hardware sales profile of the Xbox One. On the opposite end of the spectrum the Wii U had a complete opposite reaction when Mario Kart 8 made it onto the market, getting the console to sell consistently week in and week out for Nintendo. The five week average for the Wii U prior to the release of Mario Kart 8 was quite abysmal, so in comparison to the PS4 and Xbox One the Wii U's total sales average following the release of Mario Kart 8 looks massive because it is massive. While the Xbox One middled out at around the same numbers before and shortly after the release of Titanfall, and the PS4 gaining some extra momentum from inFamous, the Wii U was the only one that skyrocketed in sales from its first-party title. The real question is even with such a massive boost to the hardware sales of the Wii U thanks to the first-party racer, how well will this work out during the dry months of July and August? And will the Wii U be able to maintain sales momentum with other lesser-promoted titles such as Hyrule Warriors and Bayonetta 2?